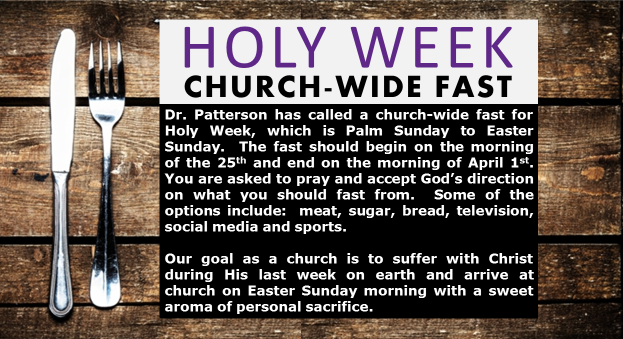 Dr. Patterson has called a church-wide fast for Holy Week, which is Palm Sunday to Easter Sunday. The fast should begin on the morning of March 25, 2018, and end on the morning of April 1, 2018. You are asked to pray and accept God’s direction on what you should fast from. Some of the options include meat, sugar, bread, television, social media, and sports. Our goal as a church is to suffer with Christ during His last week on earth and arrive at church on Easter Sunday morning with a sweet aroma of personal sacrifice.